The Change Curve is a simple and powerful model used to understand the different stages of personal transition and organizational change. It helps you, as a leader, predict how people will react to your changes so that you can help them implement your new CS Strategy and make their own personal transitions, and make sure that they have the help and support they need. By understanding the Change Curve you will accelerate the implementation of your new CS strategy making changes faster, and Increase Its Likelihood of Success. At this point you’ve invested a lot of time and dollars in new CS Strategy and prepared all processes to be ready to implement, you’ve trained your team, and you’ve made the employees lives easier (or so you think). However, employees continue in their old ways and habits. Do you look for the fast business improvements you expected in customer satisfaction, customer loyalty, and profit? And when will the disruption of the old habits happen? Employees change because the other employees within the organization adapt and change too. Only when the employees within the organization have made up their own personal transitions can an organization truly reap the benefits of change. As someone needing to make changes within your organization, the challenge is to help and support people through these individual transitions, which can sometimes be intensely traumatic, and involve loss of power and prestige… and even employment. The easier you can make this journey for people, the sooner your organization will benefit, and the more likely you are to be successful. However, if you get this wrong, you could be heading for the project – and career – failure. 1: Status Quo: When a change is first introduced, people’s initial reaction may be shock or denial, as they react to the challenge to the status quo. 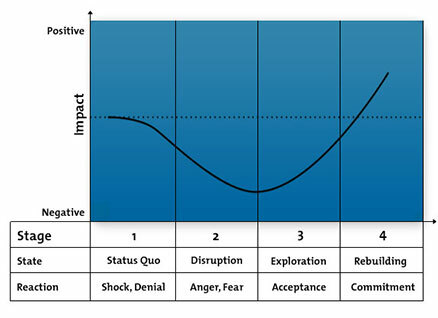 2: Disruption: Once the reality of the change starts to hit, people tend to react negatively and move to stage 2 of the Change Curve. They may fear the impact; feel angry, and actively resist or protest against the changes. Some will wrongly fear the negative consequences of change. Others will correctly identify real threats to their position. As a result, the organization experiences disruption which, if not carefully managed, can quickly spiral into chaos. 3: Exploration: At stage 3 of the Change Curve, people stop focusing on what they have lost. They start to let go and accept the changes. They begin testing and exploring what the changes mean, and so learn the reality of what’s good and not so good, and how they must adapt. 4: Rebuilding: By stage 4, they not only accept the changes but also start to embrace them: They rebuild their ways of working. Only when people get to this stage can the organization really start to reap the benefits of change.